The event attracted guests working in the climate policy area from academia, business as well as policymakers. 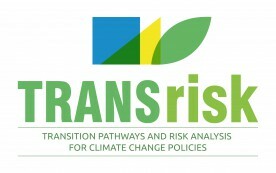 The event focused on two key aspects of climate policy that were explored within the "TRANSrisk: Transitions pathways and risk analysis for climate change mitigation and adaptation strategies" project. The morning session was devoted to the work on identifying and understanding the risk and uncertainties that are inherent in a transition to a low carbon economy. An introductory presentation on the subject was delivered by Susanne Hanger-Kropp from ETH Zurich. This was followed by a panel in which TRANSrisk partners discussed in detail the social, technical and spatial planning risks. Our Institute was represented by Marek Antosiewicz, Aleksander Szpor and Jan Witajewski-Baltvilks. During the afternoon session TRANSrisk partners presented the innovative modelling tools and techniques they developed over the course of the project. These tools can assist policy makers in predicting the impacts of the decisions they make in a rigorous, organised way. Alexandros Flamos from UPRC presented economic modelling tools, Wytze van der Gaast from JIN described novel methods for including stakeholders in the policy making process and Haris Doukas from NTUA showed a framework for integrating computer modelling with other decision support tools. One of the tools, the mitigation toolbox was presented by Marek Antosiewicz from our Institute. It is a user friendly web application which allows non-experts to run simulations with the MEMO (MacroEconomic Mitigation Options) model. Using the model provides an assessment of the overall economic cost of implementing various climate change mitigation policies such as environmental taxes or direct mitigation actions in different sector of the economy. During the presentation, Marek Antosiewicz also showed how the toolbox was used to assess the cost of decarbonising the Polish electricity generation sector. Afterwards, Jan Witajewski-Baltvilks and Marek Antosiewicz held a short training course for participants on how to run, interpret and analyse simulations with the mitigation toolbox. Detailed agenda and presentations are available at the TRANSrisk website. More information about Polish part of TRANSrisk project → read.